How can I hide my balances? You can hide balances and show % of holdings instead. Check here. Want to share a screenshot of your portfolio? Want to open Delta in public? No worries! You can now hide your balances and instead display the holdings as a % of your total portfolio worth. 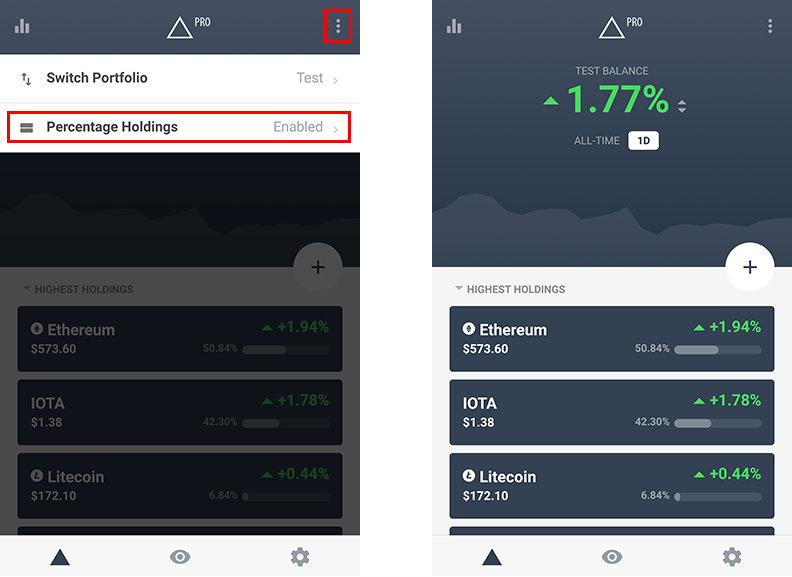 To hide your balances and display your holdings as a percentage, tap on the 3 dots to the top right of your portfolio main screen to open the menu and tap on 'Percentage Holdings' to enable it. Do the same to toggle between percentage mode and normal mode. We also have a 'Shake to to enable % holdings' feature (Settings -> Other Options). If you turn this on, you can simply shake your phone to toggle between normal and hidden/percentage mode.